Google is constantly beefing up its search results. You can now find out who in your social network has +1’d a page, who has shared it on Google+, and even makes it easy to add bloggers to your Google+ circles right from your search results. If you want to find out a bit more about how your search results are being shared on other social networks, you can use the brand new site, Google with Social Stats. Put together by Amit Agarwal of Digital Inspiration, search results are accompanied by Facebook likes, Tweet counts and Google+ shares. This kind of data can be interesting if you want to find out if a page has been shared extensively before sharing it with your followers and friends. This isn’t the first site of this kind that we’ve seen. We recently covered the website Is It Old? which lets you know when a page was first shared, and how many times it has been shared on Twitter. 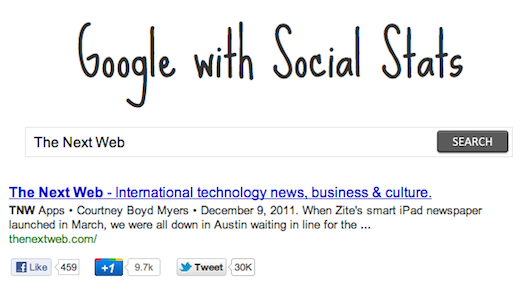 With Google with Social Stats, you now have the added benefit of finding out how it has been shared on Facebook and Google+. The site also makes it easy to share your search results directly from the search page without having to actually open the link. Google Chrome, Firefox and Internet Explorer users can also add the customized search engine to their browsers. It serves standard Google web search results but enhanced with image thumnails and social statistics so you can easily spot the most popular stories.